AquaSpot. Boiling water kitchen faucet. The AquaSpot tap is an extra heating element connected to a standard built-in boiler (6 ltr. 100ºC - 12 ltr. 60 °C) to produce boiling water instantly (2-10 seconds). 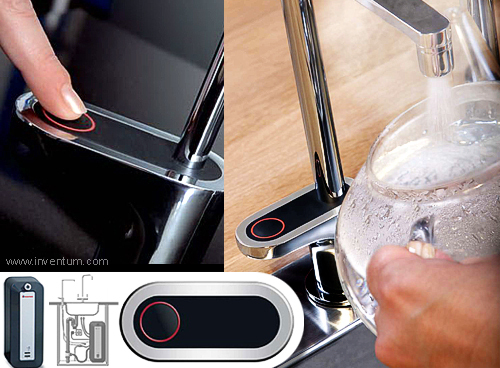 The faucet can be rotated 360º and is height adjustable for the different use of filling a cup or filling a pasta pot. It features a unique ergonomic touch-button interface with a red circular LED indicator as visual feedback. The patented built-in security feature IntelliProtect gives the user a choice of three different adjustable levels to protect adults from unintended use and children from burnings. Dimensions: 210x 300x 520 mm.